On vacation in Los Angeles, Walter, the world's biggest Muppet fan, his brother Gary (Jason Segel) and Gary’s girlfriend Mary (Amy Adams) from Smalltown, USA, discover the nefarious plan of oilman Tex Richman (Chris Cooper) to raze the Muppet Theater and drill for the oil recently discovered beneath the Muppets' former stomping grounds. To stage a telethon and raise the $10 million needed to save the theater, Walter, Mary and Gary help Kermit reunite the Muppets, who have all gone their separate ways: Fozzie now performs with a Reno casino tribute band called the Moopets, Miss Piggy is a plus-size fashion editor at Vogue Paris, Animal is in a Santa Barbara clinic for anger management, and Gonzo is a high-powered plumbing magnate. 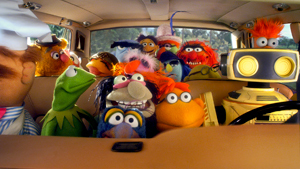 With secret, signature, celebrity cameos, Disney’s “The Muppets” hits the big screen Nov. 23, 2011. If your kids are too young to play this game, check out my travel ideas for preschoolers. Get the kids entertained, and then force your husband to play the Muppet game with you. That's what I am going to do! Have safe travels, everyone! The Muppets will be my kids' first theater experience...if we make it there. :) We're big fans.